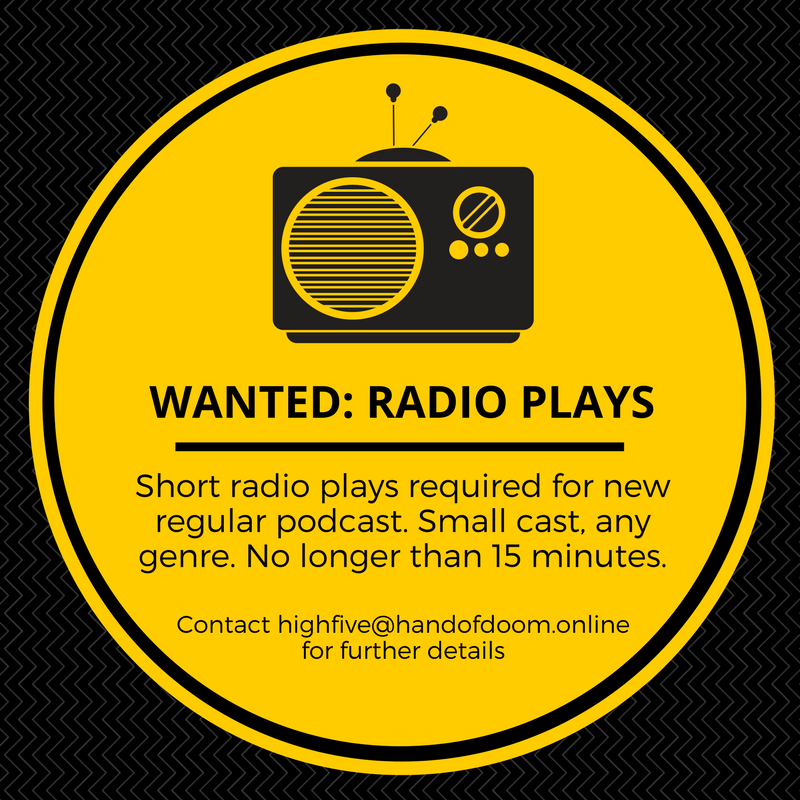 Hand of Doom Productions – A production company producing plays, comedy, storytelling and poetry. Writer? Actor? Comedian? Poet? Get in touch! Our final radio play from last year’s recording session in Faversham is A Great Idea by Les Clarke. Thanks again to Robert “Woody” Burgess who recorded and produced all the plays for us. Cast: Paul Doust as Dan; Ian Riches as Gerry. That’s the last of our radio plays for now, but we enjoyed recording them so much we’ll be doing some more this Spring. Keep an eye on this website for a call-out for scripts. Our penultimate radio play from last year’s recording session in Faversham is Safe Word by Ribs Norman. Thanks again to Robert “Woody” Burgess who recorded and produced all the plays for us. Cast: Anthony Hall as Ulrich; Jude Sach as Soph; and Ribs Norman as Lucy. We’ll share our final radio play from this session next Monday. As promised, here’s the second of our four radio plays which we recorded last year in Faversham. Thanks again to Robert “Woody” Burgess who recorded and produced all the plays for us. Mrs Shipley’s Spinning Wheel was originally a short story written by Michele Sheldon and was adapted into a radio play by the author. Susan Anderson played Daughter and Nicola Carter played Mother. Stay tuned for play number three next week! We are delighted to release our first radio play, Clouds by Sarah Davies. We had a fun day recording this and three other plays in Faversham. Our thanks go to The Limes pub who let us use their plush upstairs room, to Robert “Woody” Burgess who recorded and produced the plays for us, and to all the actors who took part. Romeo was played by Jack Finch-Harding and Mercutio by Anthony Hall. Sarah Davies was the writer. We hope you enjoy the play. We’ll be posting the remaining three over the coming weeks. 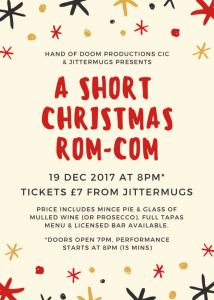 Tickets are £7 from Jittermugs and include a mince pie and a glass of mulled wine (or prosecco). Tapas menu and licensed bar available. 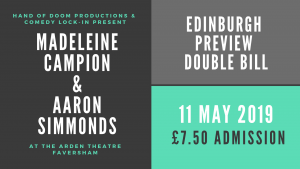 Strictly limited audience capacity, so don’t wait until the night itself to get your ticket. Doors open at 7pm, performance starts at 8pm. It’s only a 15-minute play though, so don’t be late or you’ll miss it! 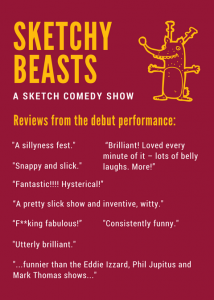 As you can see, Burgess & Norman’s debut sketch comedy show, Sketchy Beasts, went down very well with the full capacity crowd at the Fleur de Lis hall on November 11th. Thanks to everyone who attended. If you liked what you saw – or are gutted you missed out – fear not! Burgess & Norman are now planning to take the show on the road, ending with a grand finale at HopFestFringe in September (of course!). In the meantime, they will be performing at the Private Widdle Social Club on January 27th (Deal) and in Folkestone Comedy Club on February 3rd (Folkestone, obvs). Then, as if that wasn’t enough, he is ending the tour with a gig in a 400-seat theatre in his hometown. He’ll also be recording a documentary as he goes while hoping not to regret it. He’s good by the way, should have probably have said that earlier. 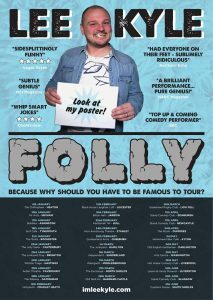 He’s done a bit of telly and radio but nothing you’ll have seen, which is a good thing really or the whole point of the tour won’t have made sense. He had a book out last year, that was in the top ten comedians’ books on Amazon UK and led to almost no rasing of his profile. His podcast with Sammy Dobson (from BBC’s Boy Meets Girl (yep, she’s better known) is called Which Is The Best? and is funny and is liked by people who like it. Come on, get on board, take a chance. Be cool. Author Ribs NormanPosted on November 27, 2017 May 12, 2018 Categories plays, podcasts, radio3 Comments on Calling All Playwrights! Last Friday, September 29th, we held our Tales of the Triennial storytelling event in a new (to us) venue – The Troubadour of Kent. It’s a lovely little micropub on Tontine Street in Folkestone. The owner, Mark Swain, also wrote one of the stories. There wasn’t much room by the time everyone had arrived, so we think we were pretty much sold out (bean counter to confirm). 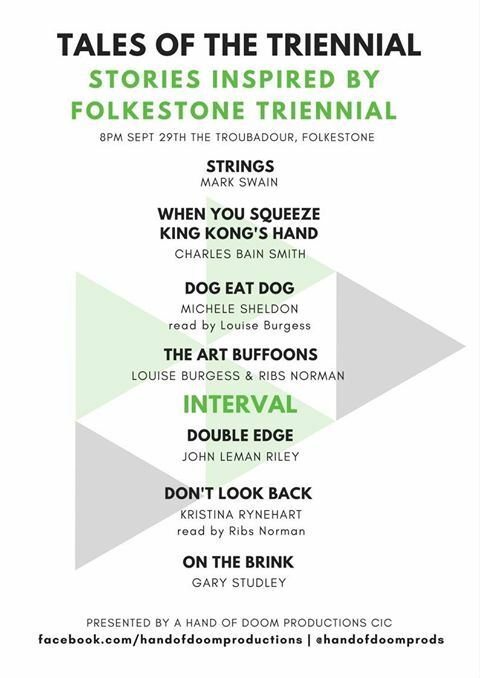 This event was a one-off to coincide with the fantastic Folkestone Triennial, an arts festival held every three years in the town. All the stories were written in response to artworks from this or previous Triennials (many are permanent fixtures), or to the theme “DoubleEdge”. All in all, a great event. Next up – Spooky Stories for Grown Ups at The Grand on October 27th. We’d like to thank everyone for entering our first short story competition. We very much enjoyed reading your entries and appreciate your support. We would also like to mention Barbara Woodhams, whose story had us in stitches and is thus Highly Commended. 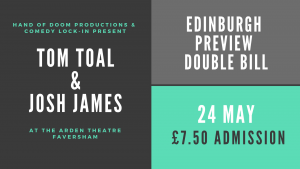 James’ story will feature at both of our upcoming Storytelling for Grownups evenings, taking place in Folkestone (May 19th) and Faversham (May 20th). As his prize, James receives two tickets to the venue of his choice, plus a cut of the profit from both events. We’re busy planning our next live storytelling event and we want you to be part of it! 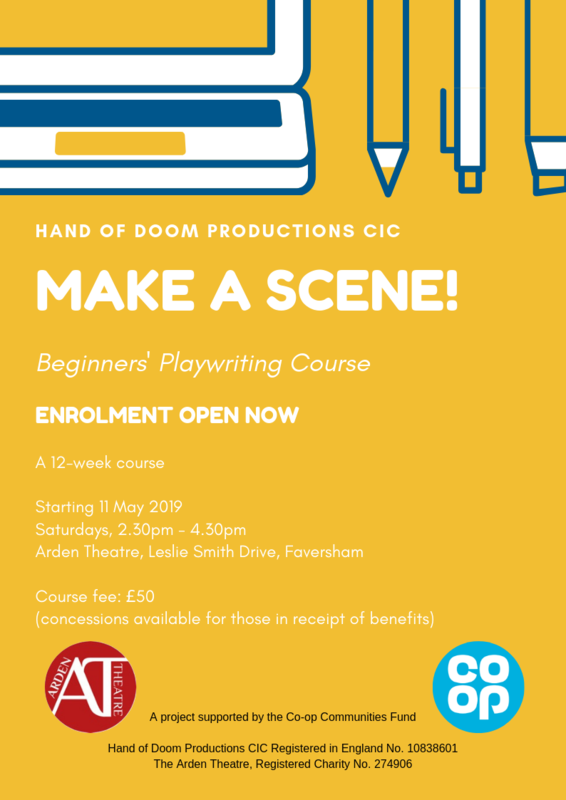 We’re looking for a new short story or monologue that we can perform at our May event, which will be taking place in both Faversham and Folkestone. Entries need to be in by April 30th. Please send an email to highfive@handofdoom.online with the subject “May Short Story Competition”. Please include your name, mobile number and story title in the email, but do not put your name on the story itself so that we can read them anonymously. The competition is £4 to enter. The winner will have their story or monologue read at both events and receive a cut of the profits (sadly never massive, but it’s still payment for writing!). The winner will also get two free tickets for the venue of their choice (venues and dates to be confirmed shortly). Entries may take the form of a short story or monologue. 2,000 words maximum, no minimum. The title is not included in the word count. All entries are judged anonymously: do not include your name on the document. All entries should be on the loose theme of “May”. Interpret this as you see fit. 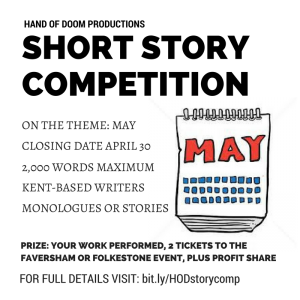 Entrants may submit as many stories or monologues as they wish, as long as the fee is paid for each entry. Entrants may withdraw entries from the competition by notification in writing; entry fees will not be refunded. The deadline date for entries is 12 midnight (UK time) on April 30th 2017. The Competition is open to writers residing in the county of Kent only. Entries must never have been published, self-published, published on any website, blog or online forum, broadcast nor winning or placed in any other competition. If your entry has been longlisted or shortlisted in other competitions, and provided it has not won a prize or been published, then it is eligible for the Competition. Simultaneous submissions are allowed but will become ineligible should they win a prize or be published prior to the prizegiving date; entry fees will not be refunded. You must inform Hand of Doom Productions immediately should your entry be published or win a prize elsewhere. Entries to be double-spaced and a word count noted at the top of the first page. The filename of online entries must be the title of the entry and it must be either a .doc, .docx, .rtf, .wps, .pdf or .txt file. Entries are confirmed by the email receipt of your payment to PayPal. The winner will be contacted by the judges in early May. If you do not hear from us by the date of the first event, it means your entry has not been selected on this occasion. Worldwide copyright of each entry remains with the author, but Hand of Doom Productions will have the unrestricted right to publish the winning story or monologue, (including Highly Commendeds), in any relevant promotional material. The judges’ decision is final and no individual correspondence can be entered into. Judges are unable to comment on individual entries. Judging is fair and unbiased. Experienced readers assist the named judges in selecting the shortlists. The prize is a reading of the winning entry at two live storytelling events in Faversham and Folkestone. In addition, the winner will receive two complimentary tickets to the event of their choice, plus a proportion of any profit made from ticket sales. Hand of Doom Productions reserves the right to amend these rules where it is deemed necessary to do so. Any changes to the rules will be posted on the Hand of Doom Productions website.